On another day of fluctuating fortunes, Sri Lanka gained a decisive advantage to leave India facing a stiff task in their attempt to level the series. After losing six wickets in a dramatic first session, Sri Lanka rebuilt in the second, thanks to Thilan Samaraweera and Ajantha Mendis, and set a challenging target on a crumbling pitch. Suraj Randiv carried on the job in the final session with three breakthroughs, including Virender Sehwag, to complete the turnaround. The pressure on India grew with the fluent progress of the Sri Lankan innings even after they had been reduced to 87 for 7. Rarely did Samaraweera or Mendis offer a chance, adapting well to the turn and bounce with solid defence and a steady flow of singles. Just as he had during his century in the first innings, Samaraweera played the ball late, and with skilful use of the wrists, worked the ball around. There were the timely improvisations as well, as he swept, slog-swept, charged out of the crease to find the boundary and soon enough, as the field spread out, showed plenty of confidence in Mendis by rotating the strike. Samaraweera's solidity and patience almost ruled out the possibility of a wicket at one end. It must rank as one of his finest knocks, in conditions far tougher than what he faced in several of his grinding centuries. His vigil ended when he tried to pull a short ball fine, gloving a catch to MS Dhoni, but only after the scales had tilted. The Indian bowlers were effective as long as the ball remained newish with Pragyan Ojha getting the ball to bite and turn. The spinners had to push the ball through quicker as it grew old and Amit Mishra, especially, was negotiated with ease as he rarely varied his pace, didn't derive much spin and wasted the extra bounce. The odd occasion where Mendis was in trouble was when the ball popped up in the vacant short-leg area off an inside edge but, for the bulk, he was at ease driving the pitched-up deliveries through the off side, offering the full face when defending and opening up intermittently. Though roughed up by a couple of Ishant Sharma bouncers that struck his fingers, he dispatched his wide deliveries through point and over gully and swept Ojha into the stands. The 118-run stand between Thilan Samaraweera and Ajantha Mendis is Sri Lanka's highest for the ninth wicket, and their third century partnership for that wicket. It's the sixth hundred stand for the ninth wicket against India. Sri Lanka were 125 when the ninth wicket pair came together, which is the fourth-lowest score at which the ninth wicket has added 100 or more runs. The lowest was when Asif Iqbal and Intikhab Alam added 190 after Pakistan were reduced to 65 for 8 against England at The Oval in 1973. Mendis' 78 is the highest by a No.10 Sri Lankan batsman in Tests, and the eighth-highest for all teams. Virender Sehwag averages 28.73 in the fourth innings, which is only slightly more than half his career average of 54.14. Of the 11 times he has been dismissed without scoring in Tests, five have come in the fourth innings. Rahul Dravid's average of 33.10 in Sri Lanka is his lowest in any Test-playing nation. In 21 innings here he has scored only one hundred. South Africa is the only other country where he averages less than 35 (33.60). Mendis took the lead once Samaraweera fell, adding more valuable runs to the lead as the seamers struggled with their lengths amid defensive fields. Ishant didn't bowl a single yorker in his spell and consistently bowled short with two slips and three men behind square in the deep on the off side. Mendis slashed a couple of boundaries and when Ishant pitched on a length, lofted him straight and over extra cover. Mishra finally dislodged Mendis when he drove him straight to an alert Suresh Raina to end the innings. Sri Lanka had seen enough during their batting to realise the importance of a newish ball and immediately opted for the offspinner Randiv to bowl with Lasith Malinga. He found the fizz he needed off his first ball to Sehwag who was beaten when attempting the cut. He played for turn the next ball, it went straight on as he opened the face, and found Mahela Jayawardene, whose celebration reflected the enormity of that wicket in the context of the result. India's woes compounded when Randiv got one to spit at Rahul Dravid, who dropped one close to his feet only for it to spin back towards the stumps before he could kick it away to end a disappointing series. And shortly before the close, he had M Vijay closing the face to a shortish delivery and guiding it to a perfectly placed Jayawardene at leg slip, who took a low catch. The spinners were expected to play a prominent role on the fourth day but Sri Lanka adopted an attacking approach against them in order to progress to a safe score. Jayawardene and Kumar Sangakkara cut, swept and stepped out to Ojha but he accounted for them both: surrounded by catchers, Jayawardene was beaten by the turn to be caught at slip and Sangakkara, sensing a boundary when facing a long-hop, pulled one straight to square leg where Raina managed to hold on to a tumbling catch. 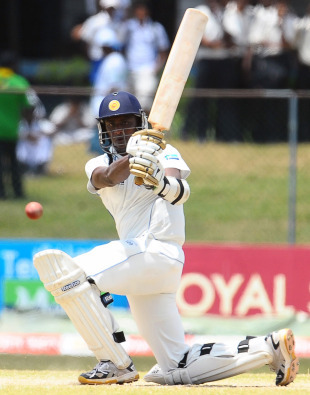 India surged ahead with the introduction of Mishra into the attack, as he sent back Angelo Mathews and Prasanna Jayawardene off successive deliveries. Then began the fightback. Malinga chanced his arm in a 38-run stand with Samaraweera, Mendis fought through a wicket-less second session and an hour into the next, and Sri Lanka's last three wickets had accumulated a potentially decisive 180. In the end, a battling Sachin Tendulkar was left carrying India's hopes.